The class 25 was a BR design built from 1961 to 1967 at Darlington and Derby works. (Beyer Peacock also built some locos in 1965/66). In total 327 were constructed. The design of this locomotive evolved from the class 24, and was fitted with 6LDA28-B 1250hp Sulzer engines, and had a 90mph top speed. A redesigned bodyshell was introduced by Derby from 1963, and used on locos that became 25083-217/248-327. 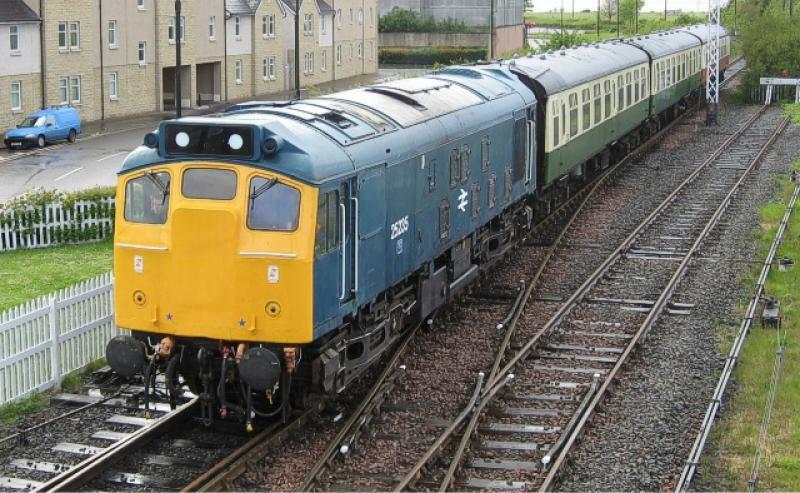 Class 25s had worked across the border into Scotland for several years before the Scottish Region received its first allocation of class 25s. These were D7611-23 (25261-273) delivered new to Eastfield during 1966, to replace steam locos on freight in Ayrshire. These 13 locos had square recesses under the drivers windows for tablet catchers (never fitted). Later in 1966 eleven more, D7698-7609, moved north from Tinlsey to Eastfield and Haymarket. These 25/3s didn't stay long on the region and between 1967 and 1969 were swapped with boiler fitted class 25s and 27s. The replacement class 25s were D7576-9/81/83/84/90/91 (25226-229/231/233/234/240/241), and these locos were fitted with dual (air and vacuum) brakes in 1970. In the early years of the Edinburgh - Glasgow Push & Pull service, these locos often substituted for class 27s. Many more class 25s were transferred to Scotland in the 1970s as replacements for class 24s. The class 25s could be found on most routes in Scotland, mostly on freight, but also passenger workings in place of class 27s, particularly the Glasgow - Dundee route. The 25/0 locos 25001-025 were not equiped with boilers or air brakes, and had non-standard BTH traction motors (others had AEI motors). They were progressively withdrawn between 1976 and 1980. The influx of Class 37s from 1978 onwards enabled the Scottish Region to remove the class 25s from its fleet. The last twenty-two 25's based at Eastfield and Haymarket were transferred south (to Crewe, Carlisle and Longsight) in October 1982. Class 25s continued to visit southern Scotland until final withdrawal of the class in March 1987. One of the class 25912 (ex 25322) was retained by BR as a training loco. Numbered as D7672, repainted green and named Tamworth Castle. It was used on a few railtours 1989-1991. None took the loco into Scotland, however on April 29th 1991 D7672 ran light engine to MC Metals, Glasgow for asbestos removal, returning south on May 18th 1991, ready for preservation. Created by Dysgraphyk and last modified by him at 00:44, 20 of September 2016.